Welcome to the September Pinterest Challenge Blog Hop, hosted by My Pinterventures. The purpose of this Pinterest Challenge is to motivate all the participants of this hop (and you too) to not just pin, but to make it happen! This month, I chose to make a lightweight scarf using the fun, popular, corner to corner technique and some warm fall leaf appliques. Originally, I designed this scarf for submission to a fall crochet/knit magazine. 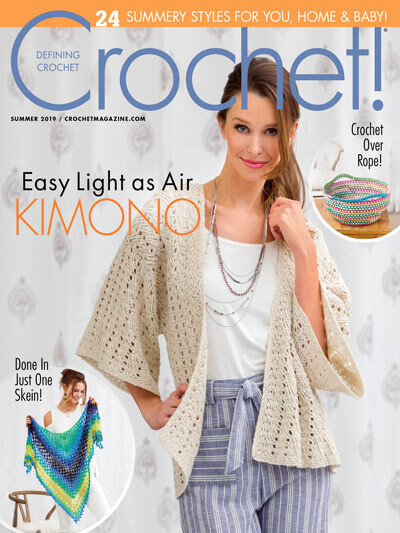 At the time, the magazine was contemplating going only knit, so I just went ahead and passed on the opportunity knowing it would be perfect to share with you guys this fall. This scarf is actually what sparked the idea for my Blessed C2C Blanket. The whole time, I thought, how cool would it be if it had the word “Thankful” or “Blessed” down one of the sides. The word was too long for it, and that’s when I went ahead with the blanket. 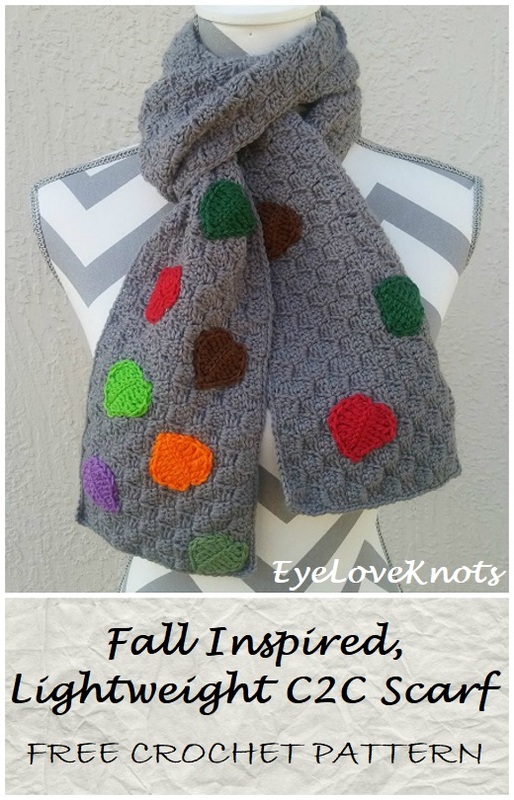 I knew I still wanted to make this scarf fall somehow, and that’s when I turned to Pinterest for some inspiration and came across this Falling Leaves Throw from Red Heart. I loved the idea of the leaves in different directions falling. I dug out my leaf pattern from my Turqua Spring Wreath, which now has it’s own post – Basic Leaf Pattern 2 Ways, and some fall colored yarns from my stash, and got to work on the leaves. 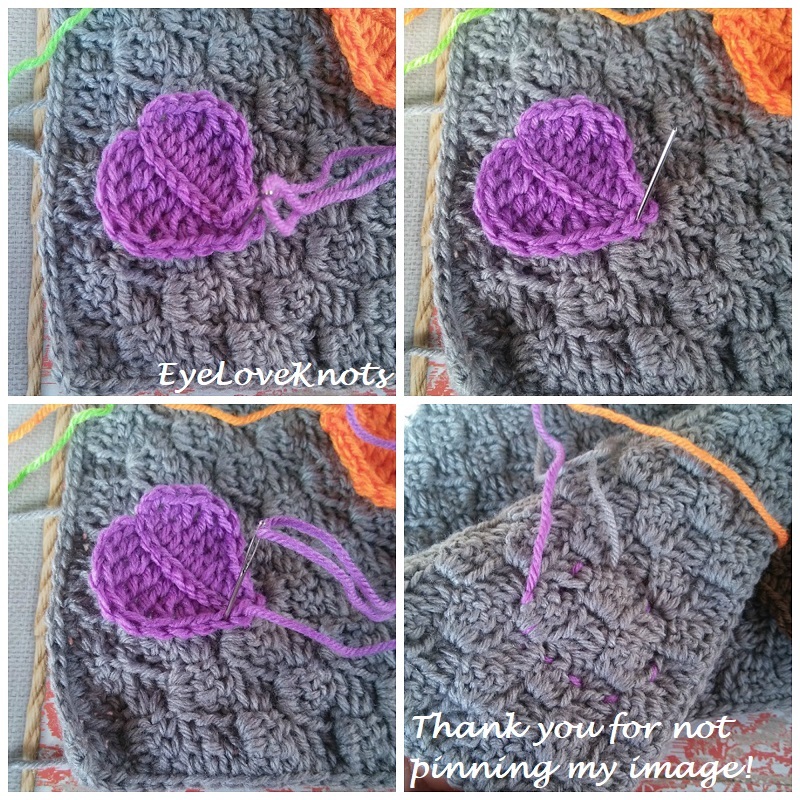 Shop EyeLoveKnots Etsy: Lightweight C2C Scarf. 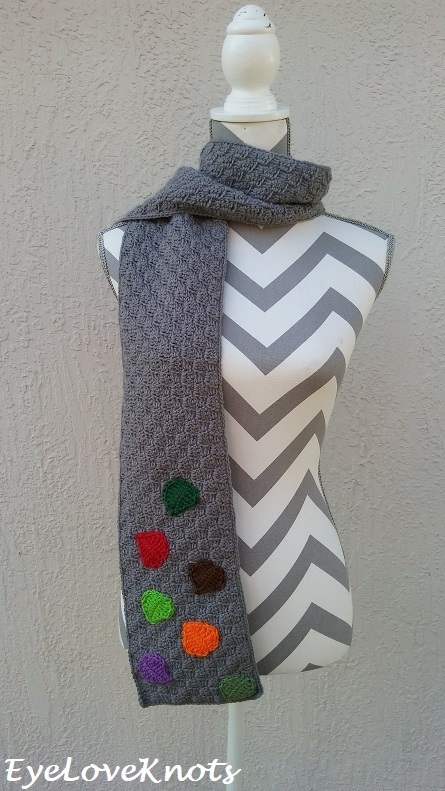 Shop EyeLoveKnots Craftsy: Lightweight C2C Scarf. Shop EyeLoveKnots LoveCrochet: Lightweight C2C Scarf. Are you a Raveler? Share your version of this project on Ravelry – Lightweight C2C Scarf. Yarn Alternatives: Berroco’s Vintage DK Yarn. I worked my scarf up in a few seatings, for a total of about 9 hours. Beginning chain counts as a double crochet. R4 – 12: Using Row 3 as a base, you will continue working in the same manner repeating (II) one extra time each row to increase the number of boxes by one each row. At the end of Row 12, you will have 12 Boxes. R15 – 129: Repeat Row 13 + 14, and Row 13 once more. R131 – 137: Using Row 130 as a base, you will continue working in the same manner repeating (IV) one less time each row to decrease the number of boxes by one each row. At the end of Row 137, you will have 3 boxes. Border: Chain 1. SC into the 1st 27 stitches, (SC, chain 1, SC) into the next stitch, SC 296 across the next side, (SC, chain 1, SC) into the next stitch, SC 28 across the next side, (SC, chain 1, SC) into the next stitch, SC 296 across the next side, (SC, chain 1, SC) into the next stitch, SC into the last 3 stitches. Join. 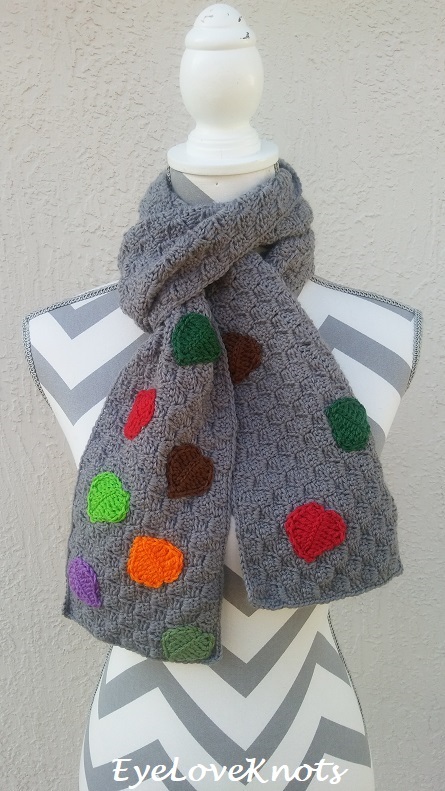 Make 10 using my Basic Leaf Pattern 2 Ways Free Crochet Pattern with vein in your choice of colors – I did 2 in chocolate brown, green and red, and one each in violet, orange, limeade, and baby sage, leaving a long tail for sewing on. I weaved my initial tail in after completing each leaf. Lay leaves out to decide placement. To sew them on, break loop, thread needle, take needle down the last stitch, then up from the wrong side in between one of the V’s, then down in between the next V, and work in this manner around. The last image above shows how it looks from the back. Weave in ends. Please feel free to make and sell your own Lightweight C2C Scarf using this pattern, but please DO NOT claim this pattern as your own nor should you sell my pattern, and DO NOT re-publish my photos as your own. DO NOT copy and paste my pattern anywhere, link to it instead. Thanks, Marci! I enjoyed picking out the colors for them, and placing them. Aw, thanks so much, Marie! I enjoy your fun DIYs and upcycles too. I love the colorful leaves! 🍁🍂🍃 And corner to corner is my favorite stitch! Such a cute scarf! Pinning! Thanks, T’onna! I think they are really fun too. So cute and cozy! Pinned. How cute. It is a great scarf for the cooler months. Tuned out amazing! Perfect for fall. I would love a scarf like this! So cute & cozy for fall those leafs are adorable! 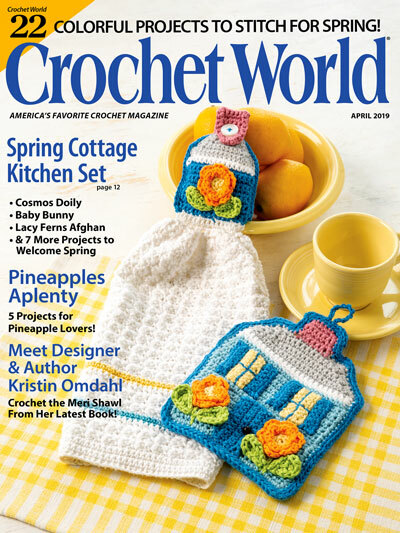 I’m seeing a ton of enthusiasm for C2C in the crochet groups I belong to. Not too many projects are long rectangles like your scarf, though. I’m pinning so next time I see someone ask how to make a C2C scarf I can direct them to your blog. 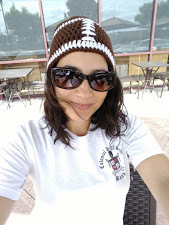 I didn’t jump on the C2C train right away, but as I have been dipping my toes in, I am loving it, and experimenting with fun projects – trying to think outside of the box. Alexandra, very cute! Only wish I had the talent to crochet. Those colorful leaves make the skarf look extra pretty. Perfect for Fall. Thanks, Habiba! They definitely give the scarf it’s personality. So fun! What a sweet take on the blanket idea. I love your bright and cheerful little leaves. What a pretty scarf for fall. I love the pops of color you included. Pinning. Thanks, Beverly! 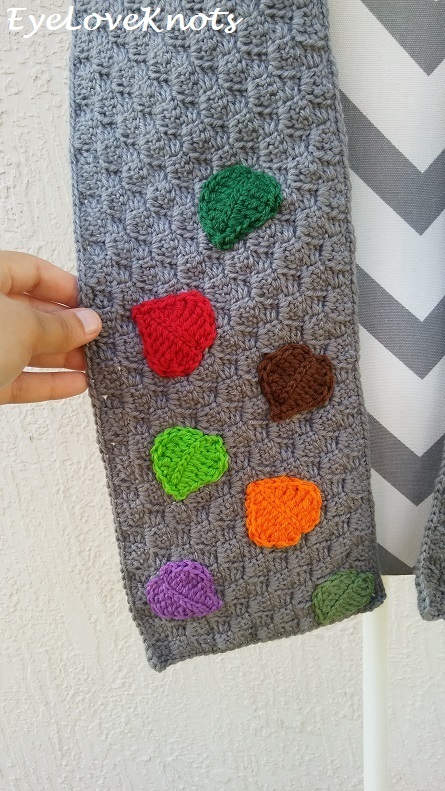 I had fun rummaging through my stash to find the perfect colors for this scarf. Super cute scarf. My mom loved to crochet but sadly I never learned. Never too late to learn 😉 Thanks for stopping by, Kenyatta! Wait, did you make that blanket too? I’m loving the fall theme on the blanket and the scarf. Will come in handy when the weather starts to cool. I didn’t make the blanket that is shown on this post, but I did design and make the Blessed C2C Blanket mentioned in this post -> https://eyeloveknots.com/2018/05/blessed-c2c-blanket-free-crochet-pattern.html. adorable scarf, love it! thanks for sharing on craft schooling sunday! it’s so pretty, I love the how it looks like a pattern of falling weaves when you wear the scarf. What a fun accessory! I think it’s great you made a neutral background stand out with pops of vibrant color. What a super scarf idea. I love the falling leaves. Very clever. Thanks, Ginny! I thought it was a cute idea. What a cute piece! Love that they are leaves, not polka dots as I thought at first glance! Hehe. Polka dots sound fun too though. So cute!! Thanks for sharing at Friday Frenzy 🙂 Pinned! Love the gorgeous brilliant leaves on this scarf! Thanks so much, Colleen! There are my favorite. Really came out better than I envisioned.